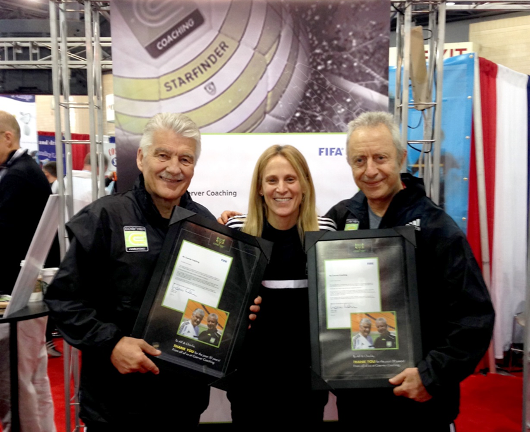 Two-time FIFA World Cup™ champion and two-time Olympic Gold medallist, Kristine Lilly, presented Coerver® Coaching Co-Founders Charlie Cooke and Alfred Galustian with a letter from FIFA at the NSCAA Convention in Philadelphia last week. The letter is an acknowledgement of Coerver® Coaching’s 30 year contribution to the global development of the game. Charlie Cooke and Alf Galustian presented with FIFA letter by Kristine LillyThe letter recognising this achievement says:“FIFA recognises that it is the dedication and long term commitment of exceptional individuals to youth football development that is critical to the future health and vitality of the modern game. Alfred Galustian and Charlie Cooke are two such exceptional individuals. As Co-Founders of the Coerver Coaching organization, Alfred Galustian and Charlie Cooke have brought a gift of skillful football to hundreds of thousands of young people in over 40 countries, and helped thousands of coaches improve their teaching of the core technical skills that form the foundation of the game.